Crystals with broken inversion symmetry can host fundamentally appealing and technologically relevant periodical or localized chiral magnetic textures. The type of the texture as well as its magnetochiral properties are determined by the intrinsic Dzyaloshinskii-Moriya interaction (DMI), which is a material property and can hardly be changed. Here we put forth a method to create new artificial chiral nanoscale objects with tunable magnetochiral properties from standard magnetic materials by using geometrical manipulations. We introduce a mesoscale Dzyaloshinskii-Moriya interaction that combines the intrinsic spin-orbit and extrinsic curvature-driven DMI terms and depends both on the material and geometrical parameters. The vector of the mesoscale DMI determines magnetochiral properties of any curved magnetic system with broken inversion symmetry. The strength and orientation of this vector can be changed by properly choosing the geometry. For a specific example of nanosized magnetic helix, the same material system with different geometrical parameters can acquire one of three zero-temperature magnetic phases, namely, phase with a quasitangential magnetization state, phase with a periodical state and one intermediate phase with a periodical domain wall state. 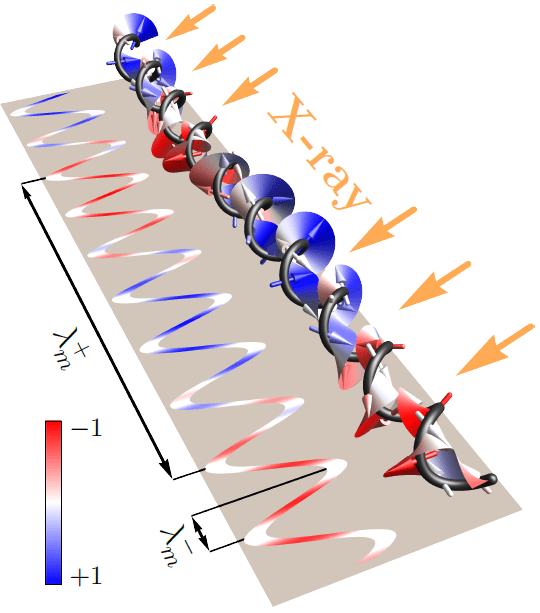 Our approach paves the way towards the realization of a new class of nanoscale spintronic and spinorbitronic devices with the geometrically tunable magnetochirality.